In the year 2000, countries around the world joined together to start the biggest ever effort to tackle global problems. It was the start of a new millennium, which marks a thousand years. Global leaders agreed that we should all do more to fight poverty, so that the new millennium would be better than the last. 189 countries agreed to work together to achieve eight big goals by 2015 - called the Millennium Development Goals. So, what are the Millennium Development Goals? Extreme poverty is when people are so poor that they cannot afford basic things like food and somewhere to live. The goal in 2000 was cut in half the number of people who are living with hunger, and with less than $1.25 (about 80p) to survive on per day, by 2015. 15 years later, the number of people living on $1.25 per day has been cut in half. But there is still more to do. 1.2 billion people are stilling living in extreme poverty, and more than 99 million children younger than five still don't have enough food. This goal was to make sure that all boys and girls could finish primary school. There have been some big successes. Within 10 years, more than 30 million more children were going to school. But there are still big problems. Often schools have very few teachers, and it's difficult for children to learn. In April this year, Unesco said that 58 million children were still missing out. Those who are disabled, or from cultural minorities often find it harder to go to school. Many of the challenges faced by children in poorer countries are particularly difficult for girls. Girls are often less likely to receive an education, and are more vulnerable to poverty, exploitation, and disease. The third Millennium Development Goal aims to remove gender inequality, especially in education. However, there are still many people who don't think that girls should have the right to education. For girls in some countries, including parts of Pakistan, it can even be dangerous to go to school. The problems of hunger and disease in lots of poorer countries are particularly dangerous for children. The fourth goal commits to protect young children, so that more can grow up safely to become adults. Improvements in things like vaccinations, and better treatments for deadly diseases have meant that now many more children are living past their fifth birthday. In poor countries, giving birth can be dangerous. In areas where there are not many doctors, many mothers struggle to get to a hospital to have their babies. New hospitals and nurses have helped since 2000, but more still needs to be done to give everyone the same protection. The sixth Millennium Development Goal aimed to fight the spread of deadly diseases. A lot of progress has been made to improve education and treatment to stop the spread of diseases like HIV/Aids and malaria. But there is still work to do. In 2013, the World Health Organisation says that children in poorer countries often die unnecessarily because they don't have the proper vaccines or treatment for diseases. Simple things like safe drinking water and a clean home are crucial for survival. but millions of people around the world don't have access to them. In 2000, world leaders agreed to try and reduce the number of people suffering in this way by half. This target has been met. Since the goals were set, more than 200 million people have better access to clean water, and are living in cleaner, better quality houses. Now, more needs to be done so that everyone has the same. Leaders also agreed to do more to protect the natural environment. Lots of governments now include a commitment to the environment in their policies, but much more needs to be done. Speakers at the UN Millennium Summit in New York in 2000. 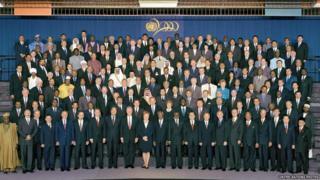 World leaders from more than 150 countries were at the United Nations Millennium Summit in 2000. They agreed that the problems suffered by the world's poorest people should affect us all. The last goal says that we all have a responsibility to work together to try and help end extreme poverty. Some major progress has been made to tackle poverty since 2000. But the progress has often been uneven in different countries, and more needs to be done to protect everyone in the world.